Thank you for shopping at The Presentation Watch Company. We sell fine engraved pocket watches, presentation wrist watches & presentation pocket watches. We are an authorized distributor for all the brands we sell - all Presentation Watch Company merchandise is new and comes with full factory warranties. Our goal is 100% customer satisfaction, whether it's a single engraved pocket watch for a gentleman or a large order for a Corporate promotion. We are committed to providing the finest quality, custom watches in a timely fashion. All engraving is done on site - here at our location, call for custom or large (corporate) orders. ENGRAVED ITEMS WILL NORMALLY SHIP (Leave Here) 2-3 BUSINESS DAYS AFTER PLACEMENT OF ORDER - VOLUME ORDERS MAY TAKE LONGER. Expedited shipping will not effect the time it takes to process and engrave your order - only the speed of your shipping. All merchandise sold by The Presentation Watch Company is guaranteed to be authentic and new, unless otherwise stated. All merchandise is guaranteed by the manufacturer against mechanical failure and defects in workmanship. Please refer to the manufacturer's warranty enclosed with your purchase for terms and service instructions. RETURN POLICY: Unfortunately, due to the nature of our product we cannot offer a return or refund for items purchased. Once the watch is engraved and personalised we have a no return or refund policy. Please contact Customer Service at sales@SterlingEngraved.com to obtain a Return Authorization Number (also refered to as a "RMA Number") prior to returning your item. Also, please note that the product must be returned to us in a "new and unused condition" and in its original gift box, with the enclosed warranty certificate intact. Returns are NOT ACCEPTED without an RMA number. We must receive your item(s) back to our warehouse within 30 days. Please place your item(s) in a padded envelope or box and mail/courier to the address below. (Please indicate the nature of your dissatisfaction with the product.) Postage, insurance and package tracking are the responsibility of the customer. Privacy is taken very seriously at The Presentation Watch Company, Our policy is simple. We will not provide, rent, or make available in any way, our customer information to any parties outside SterlingEngraved.com - period. All customer information is stored offline in an encrypted format in a secure data environment. No personally identifiable information is collected on visitors to our site. Customer E-Mail addresses are used only to send shipment updates. Customer order information, i.e. bill to and ship to addresses, credit card information and phone numbers, are used to process the order only. No unsolicited mailings or phone calls are made. If you are uncomfortable providing your phone number, please enter 555-555-5555 in the phone number field, however due to the personalized nature of these products, there often is communication required between buyer and seller. If you choose to withhold your phone number we request that you do give your E-mail. 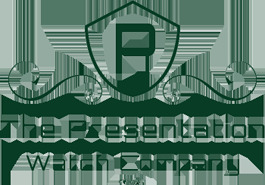 The Presentation watch Company offers 2 ordering options - Online & Phone. ONLINE: Simply click the "Order" button at the desired item(s)and follow the instructions. American Express, Mastercard, Visa and Discover are accepted online via our secure server. SECURITY: All order and credit card information is accepted in a secure environment. The Presentation watch Company uses Secure Sockets Layer (SSL) 3.0 encryption, widely accepted as the most secure technology available. In fact, there is no known case of credit card fraud in transactions conducted in this manner (SSL encryption). That's a ratio of millions to NONE. We gladly accept mail and fax orders if you are uncomfortable ordering online. We welcome customer questions, concerns and comments!